kasuri methi or dry fenugreek leaves premium quality green and machine clean and flavour full used in different indian curries to make them authentic and delicious. We are Looking for Export Enquiries Only. Frozen Methi is also known as fenugreek. Coupled with excellent medicinal virtes, is a leafy green, which is best had with salad or as cooked vegetable. It is one of the elemental seeds in making any of the delicious dishes. It provides a tangy flavor and strong curry scent to lentils and other vegetable dishes. Fenugreek Leaves (Kasoori Methi) is a naturally occurring spice. They taste similar to celery and fennel with a slightly bitter bite. 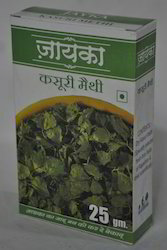 Surya’s Kasoori Methi is cleaned thoroughly in hygienic conditions before packing. These leaves impart rich aroma and flavour to the food. 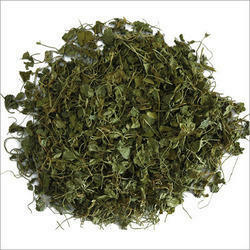 Owing to our in-depth knowledge in this domain, we are specialized in providing Fenugreek Leaves.